Charming little house of 50 m² with 3 rooms: kitchen / living room opening onto a terrace and a private garden, 2 bedrooms in a row on the floor (one with double bed and the other with two single beds). Shower room with shower and toilet. All comfort: private parking space, bike shelter closed (two city bikes available), barbecue, garden furniture, TV, WIFI, dishwasher, washing machine, iron, hair dryer, high chair, cot and baby bath on request. Possibility of a linen package and a cleaning fee surcharge. Ideal location: 500 m from the city center, 700 m from the bike path, 2 km from the beach. POSSIBILITY OF SHORT STAYS OR WEEKENDS, do not hesitate to ask us for information so that we can set you a quote. Saint Jorioz is located on the west shore of Lake Annecy 10 km from the latter. A bike path runs along the entire west bank and part of the east shore. The region offers many outdoor activities: swimming and water activities on the lake (sailing, water skiing, pedalo ...), hiking, canyoning ... It is also a popular area for cycling. The cabin was very clean and the kitchen well appointed. All the appliances and the plumbing work great. The best part about the cabin is the calm and quietness. I was a bit worried about possible noise given the proximity of neighbors on all sides. The cabin is small but accommodates a couple just fine. At most, a couple and one child. Note there is no WIFI or internet service. But then internet and WIFI was not included in the description. The village is well located around the lake and close to Annecy, if you want to drive in for dinner. All in all, it was a nice stay for one week. Séjour très reposant dans maison très agréable ! Petite maison de vacances très agréable, avec tout le confort nécessaire, et très bien située. 5 mns a pieds du centre et 10 mns a vélo du lac. Avons apprécié la mise à disposition de deux vélos , la discrétion du propriétaire et le petit cadeau d accueil... Séjour à refaire sans hésiter. Maison bien équipée, tout confort. Les propriétaires sont très agréables et disponibles. Nous les remercions de leurs accueil et reviendrons avec plaisir. 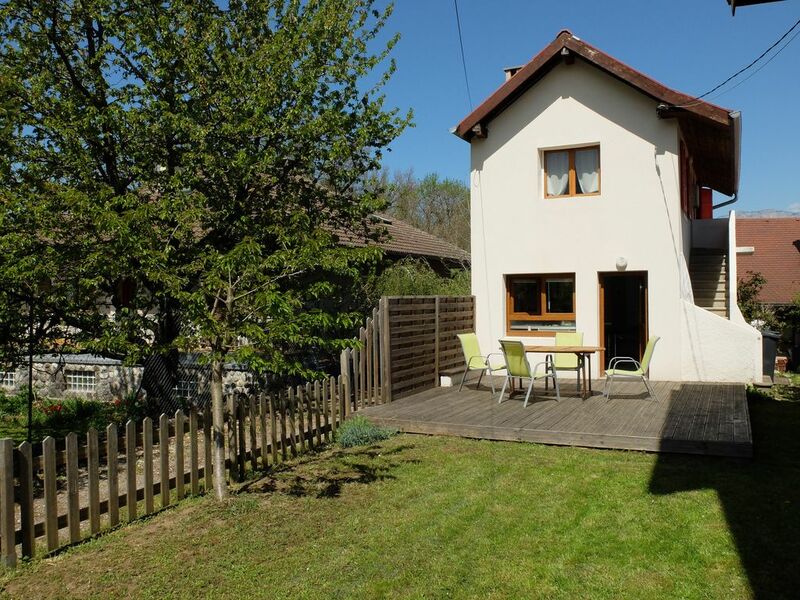 Petite maison idéale pour les vacances, terrasse et chaises longues au calme, le plus:les 2 vélos mis à disposition. Superbe petite maison très bien agencée et au calme. A recommander absolument. Nous avons passé un très bon séjour à St Jorioz. Accueil très sympa de Loic et à disposition ! Logement très propre et situé dans un secteur calme et à deux pas du village et de la plage de St Jorioz. Maison bien équipée et vélos à disposition, appréciable voie verte à proximité.